In this all-new, ten-part series, Italian-born, Australia-residing bona fide foodie, actress, opera singer and author Silvia Colloca joins SBS in a new series 'Made In Italy'. It premieres Thursday 27 November at 8pm on SBS ONE. Silvia is author of hit cookbook 'Silvia’s Cucina', and in this series she will serve up an Italy rarely seen by tourists during a culinary 'celebrazione' in 'Made In Italy with Silvia Colloca'. In this sumptuous and picturesque new series Silvia takes a journey back to her homeland to introduce her family, and present her love of healthy, hearty Italian fare. Silvia shot to culinary fame with her blog Silvia’s Cucina, which also lead to a successful cookbook of the same name. She has lived in Australia for nearly a decade and was born and raised in Milan. However her loyalty to Italian food lies within the hills and mountains of Abruzzo, a region east of Rome. It is here where Silvia’s mother came from and where she spent most of her summers growing up. And it is here that Silvia began her love with food that is simple, wholesome, nutritious and cooked with love. It is this fresh and healthy side of Italian food that Silvia wants to share and to shatter the view that all Italian fare is carb-loaded pizzas and pastas (though this is very, very good fare and integral part of Italian cuisine). 'Made In Italy with Silvia Colloca' sees Silvia visit three charming regions of Italy that are close to her heart - Abruzzo, Le Marche and Molise - to re-discover authentic 'cucina povera' (peasant cuisine). In each episode, Silvia meets locals and is invited to cook with them in their kitchens, allowing a sneak peek inside the true Italian lifestyle and culture. It is Silvia’s own family kitchen in her Abruzzo home that is at the heart of 'Made In Italy with Silvia Colloca'. She will share intimate family moments with loved ones as they cook, eat and laugh together. The Collocas reveal why Italian cuisine is not just about eating. Silvia’s children Raphael and Miro reveal grins this wide as their mamma serves up beautiful maccheroni alla chitarra (translated: macaroni alla 'guitar'). Silvia also cooks up delicious meals with her mamma for the clan of Collocas who play such an important role in this series. (This ultra talented woman is an opera-trained mezzo soprano, and worked as a musical theatre performer in Italy before becoming an actress). 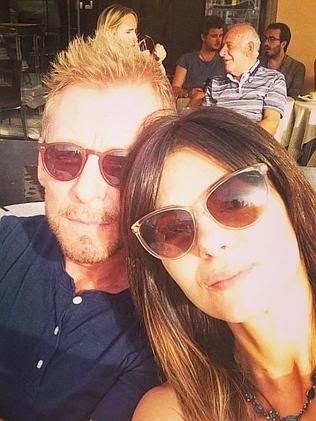 Silvia, 37 is married to Australian actor Richard Roxburgh (he has starred in 'Moulin Rouge! ', 'Blue Murder', as Bob Hawke in 'Hawke's Life', 'Rake', and directed Eric Bana in 'Romulus, My Father'). In 2004, Silvia starred in the movie 'Van Helsing', and it's here on-set she met fellow actor Richard. Richard played Count Dracula; Silvia played Verona, Dracula's consort and the leader of the Brides. Silvia and Richard married later that year, in September. Back to Silvia's upcoming SBS TV show: it's set amongst picture-perfect postcard backdrops of piazzas, ancient Roman ruins, villages perched on mountains, colourful farmer’s markets and quaint Adriatic restaurants. 'Made In Italy with Silvia Colloca' is not just a cooking show; it’s a visual banquet good enough to feast on. You can follow Silvia on Instagram here. (Just try to not salivate while looking at her foodie pics… it's impossible!) and Facebook here. Made In Italy with Silvia Colloca premieres on Thursday 27 November at 8pm on SBS ONE.